The Huntron Workstation Software Development Kit (SDK) provides a method for integrating control of instruments to the Huntron Workstation software and use with Huntron Access Probers. The Huntron Workstation software can move the prober to a location, control the instrument(s), display data, make comparisons and show results. The SDK supports numeric measurements, waveforms and images. The integration is performed creating/modifying a .NET DLL. The combination of the Huntron Workstation software, Huntron Access Probers, other instruments and the customized DLL create a fast and easy way to create effective custom prober systems. 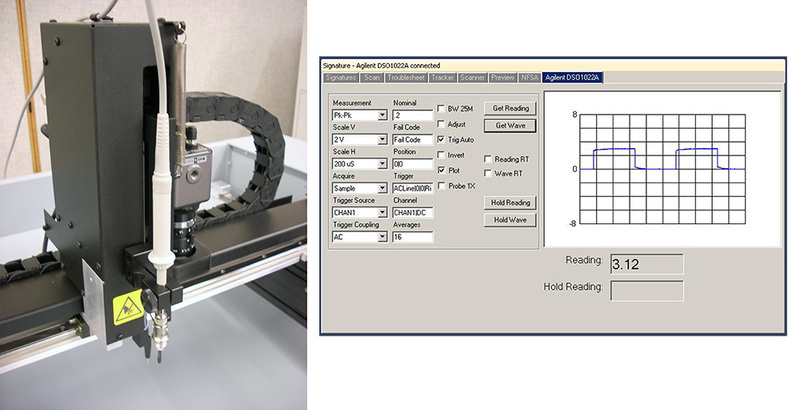 The SDK supports 3 numeric measurements, a waveform and an image for each test range. The settings for obtaining the data are customizable windows controls consisting of 6 drop down list boxes, 6 text boxes and 6 check boxes. The text of the labels for the controls is set in the DLL. The values in the drop downs are also set in the DLL. In addition there is a delay field for delaying the measurement after the probe has made contact and +/- tolerance fields for comparison. 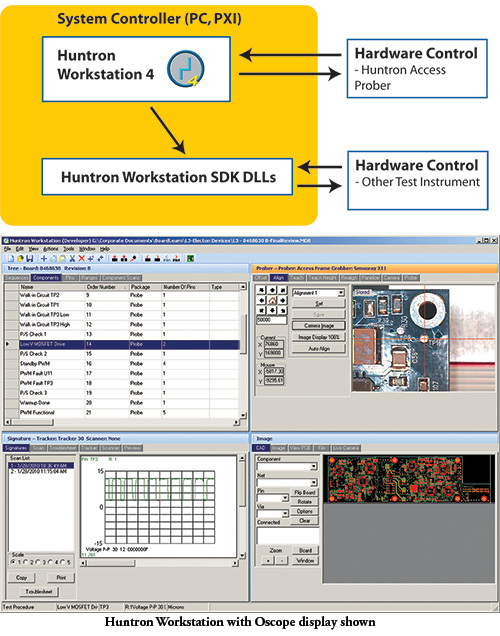 This system uses full integration of an Access Prober to take and display oscilloscope measurements with Huntron Workstation using the Huntron Workstation SDK. The oscilloscope used is a Agilent DSO 1022A USB Oscilloscope with the probe mounted in close proximity to the Access probe tip to minimize scope lead length. A custom scope probe holder was created to securely hold the probe to a coax adapter. The adapter was then wired to the standard Access Prober spring probe. This arrangement minimized the unshielded cable length. Huntron Workstation was used for all of the database development, test point position teaching and waveform storage functions. The oscilloscope measurements were displayed and stored directly into the Huntron Workstation software using the DLLs supplied in the Huntron Workstation SDK. The measurements could be compared to stored measurements and used to assist in fault location on the circuit board under test. In this system, amplitude was the only parameter compared. The module under test was powered remotely and positioned within the Prober bed without special fixtures.